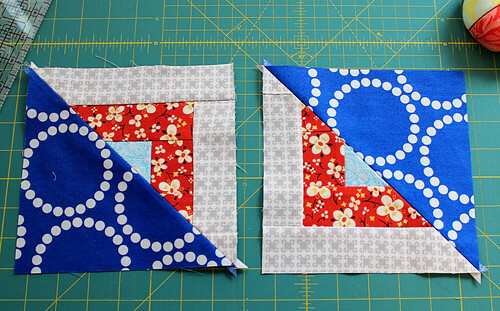 These instructions are for making two 12.5-inch blocks. 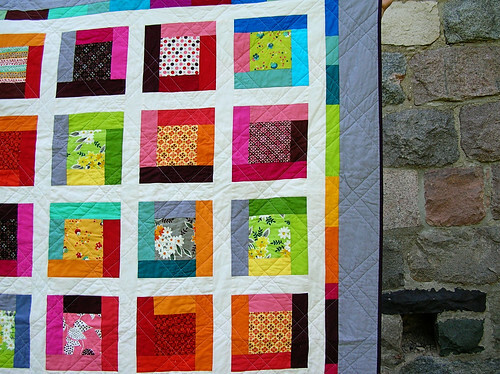 To make these blocks, you need four 7.5-inch squares, and four 7.5-inch log cabin blocks. 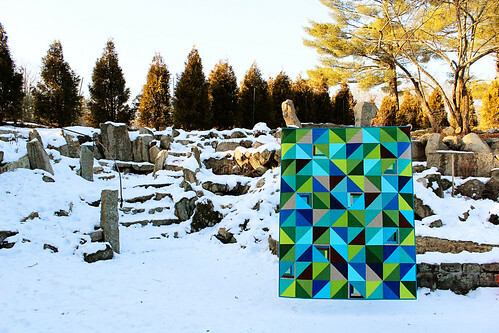 To make just one 12.5-inch block, you would only need two each of the 7.5-inch squares and 7.5-inch log cabin blocks– but making 2 at once allows for mixing up the prints a bit. 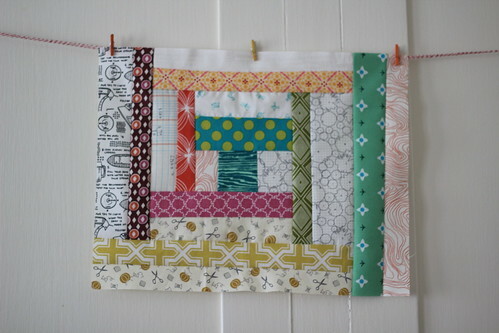 I used 2 inch wide strips to make the log cabin blocks, which worked well for the size block I was going for. 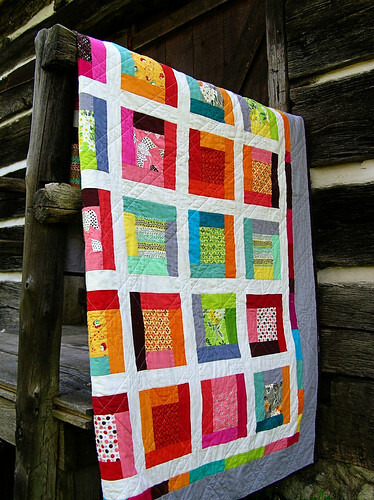 However, you can also vary the width of the “logs” in your log cabin for a more varied look! 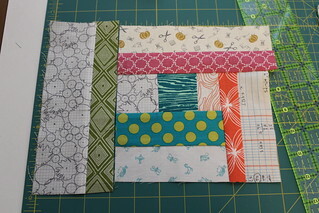 To start, I cut a number of 2 inch wide strips for making the log cabin blocks. 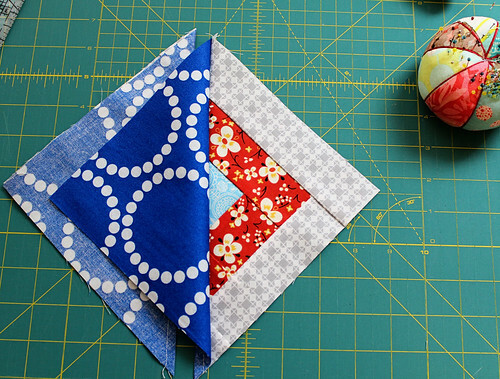 To make the log cabin blocks, start with a 2.5 inch square for the center (I just quartered a charm square for this step, but you can also use different fabrics for the centers). 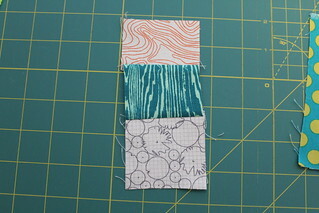 Then I added a 2.5 inch by 2 inch strip to both sides of the center square and pressed the seams. 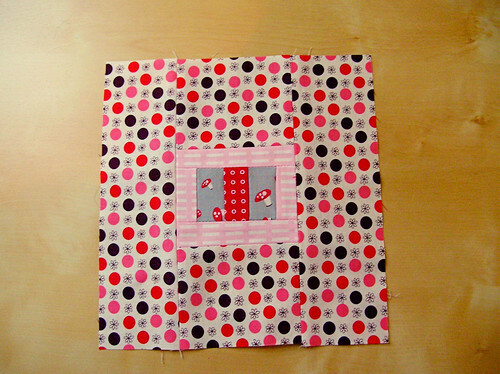 Next, I added the other 2 sides, and so on. 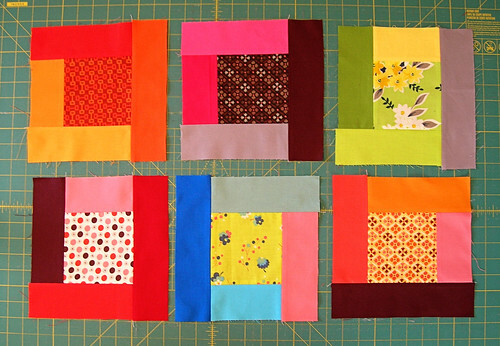 Once these were done, I trimmed them to 7.5 inch squares. 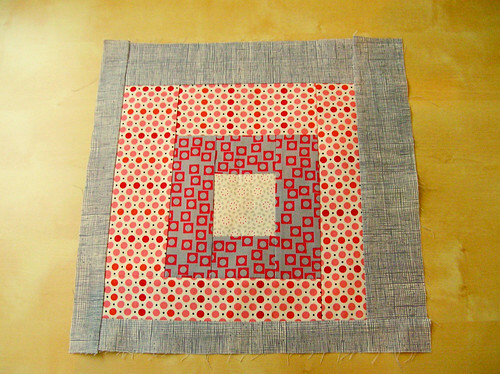 Next, I took my 7.5 inch blocks (the non-log cabin blocks) and drew a diagonal line down the BACK of the fabric from one point to the opposite. 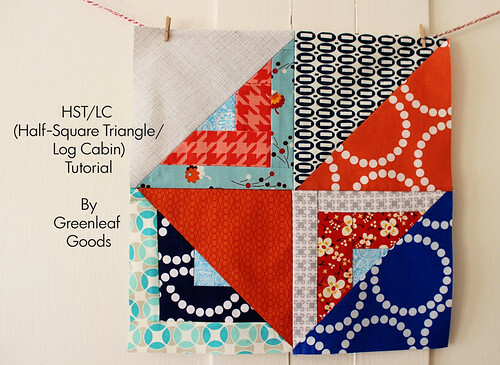 This is the first step in a commonly used technique for making 2 half-square triangles at once. 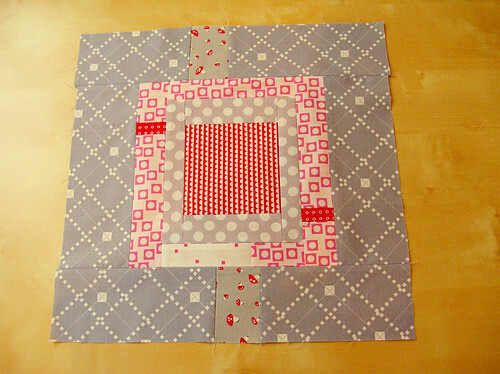 Place your log cabin block together with one of the non-log cabin blocks (right sides together). 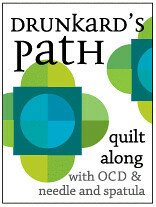 Your drawn line should be facing up. 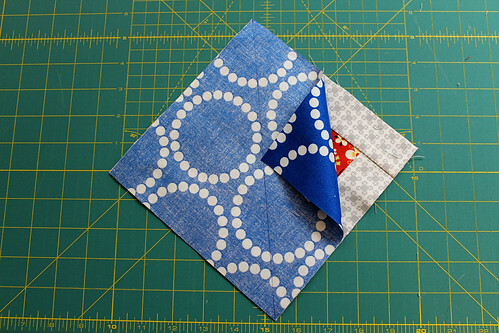 Pin these together so they don’t shift while sewing. 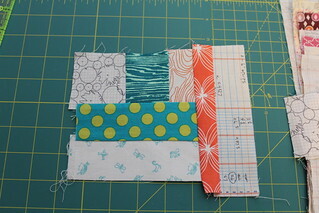 Next, sew a quarter-inch seam on EACH side of the line. 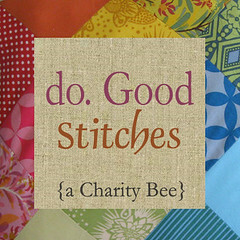 That means you’ll sew 2 lines down the diagonal of the squares, each a quarter-inch from the center line. 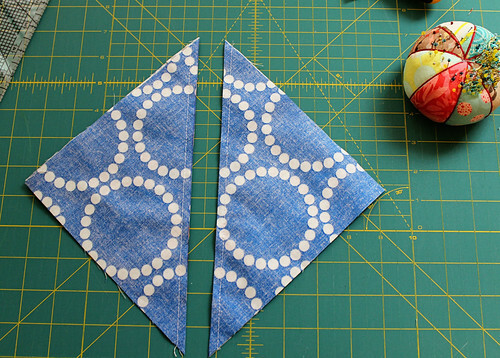 Once you’ve sewn those two lines, return to your cutting mat and cut along the original line you drew. 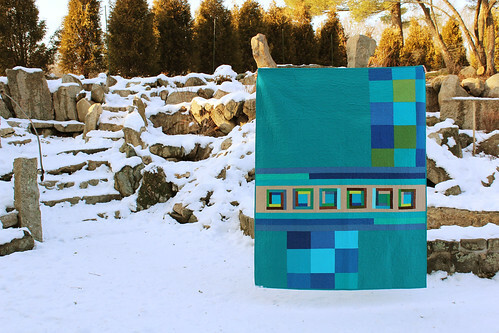 This leaves you with two half-square triangle/log cabin blocks! 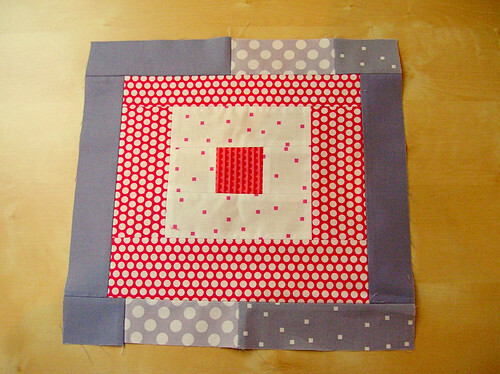 Press the seams open to reduce bulk, and repeat for the remaining blocks. 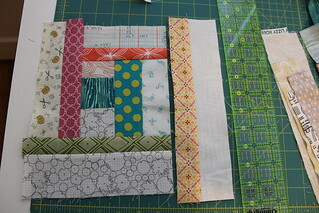 Using a clear ruler and rotary cutter, trim each block to be 6.5 inches square. 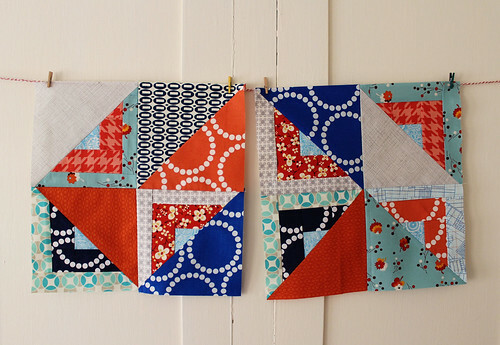 Once you have all your HST/LC blocks made, arrange them in a pattern that is pleasing to your eye. 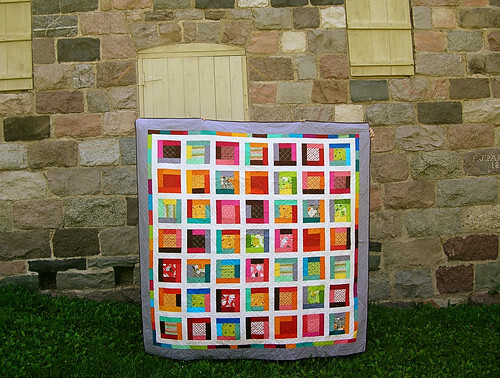 I have been loving all of the crazy HST quilts out there, so I arranged mine somewhat randomly, and that’s what I’ll ask the members of my bee to do, too. 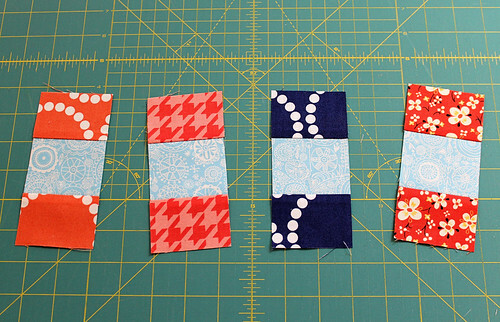 Sew the 2 pairs of blocks together using a SCANT quarter-inch seam. 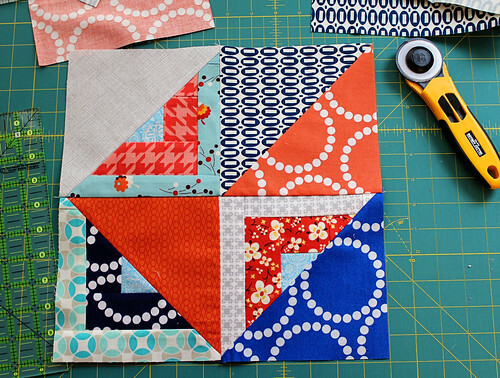 I find this matters quite a bit when trying to keep the blocks at 12.5 inches when you are done making them– a generous quarter-inch seam will make your blocks end up being a little short of the 12.5 inch mark. 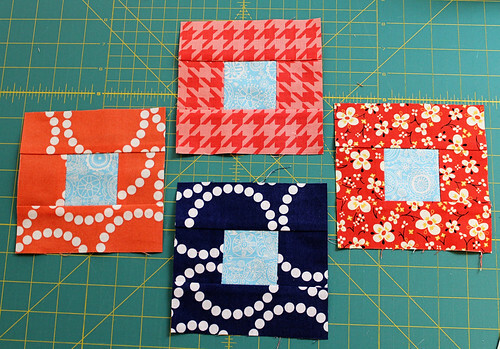 Press the seams open, then pin the sets and sew again to make a block that encompasses all of your HST/LC blocks. 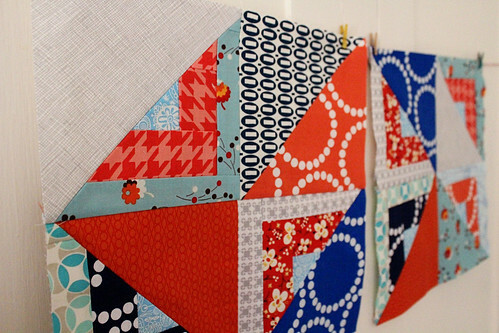 There are so many possibilities for this block– you could match up 2 log cabins to make half-square triangles for a scrappier look. 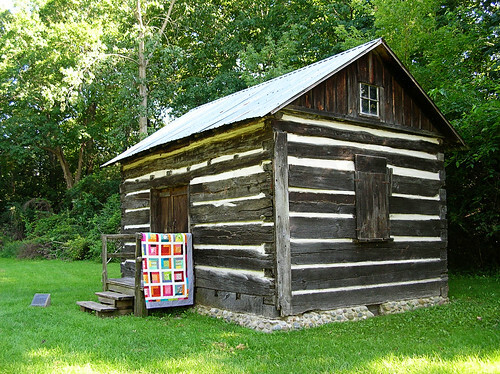 You also could use fewer log cabins interspersed in your blocks for a calmer look that still delivers some visual interest. 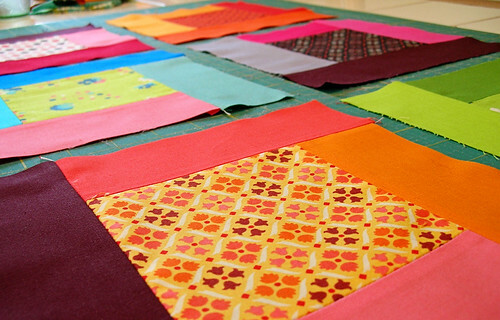 If you look closely, in one of my blocks I used 3 half log cabins, and used a “regular” half square triangle to break things up. 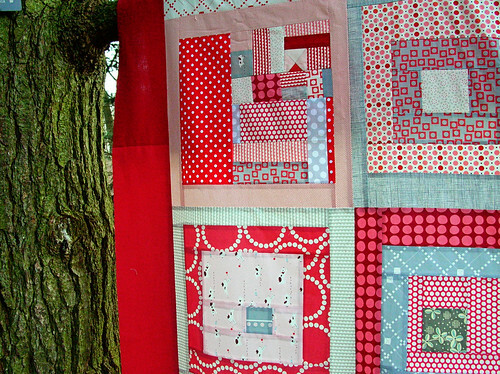 There are also a number of other ways that these blocks could be constructed, I simply found this to be the easiest way for me. 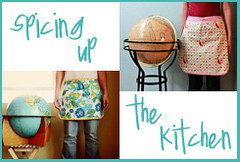 I can’t wait to see what my friends in my sewing circle make, and if you make anything using this tutorial I’d love to see it! 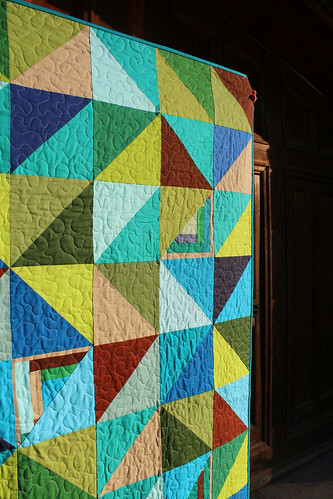 I’ve been working on this quilt for a couple of weeks now, and I managed to finish up the top this weekend! 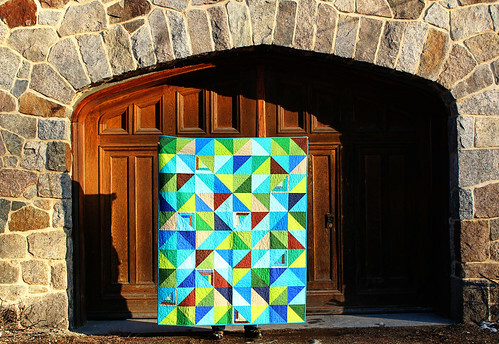 I was inspired by the colors in this post on Amanda Jean’s blog (plus, the photo on the cover of her new book looks amazing– I’m looking forward to reading that one! 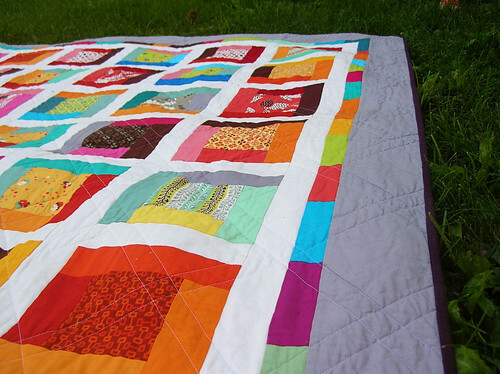 It’s a big one– roughly 85 inches square, big enough to fit on our queen sized bed. 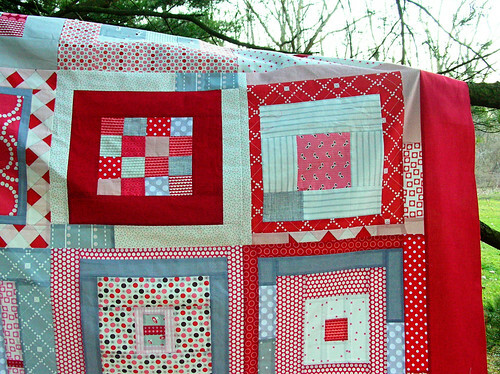 I’m backing it in grey flannel, and it will be our winter quilt! 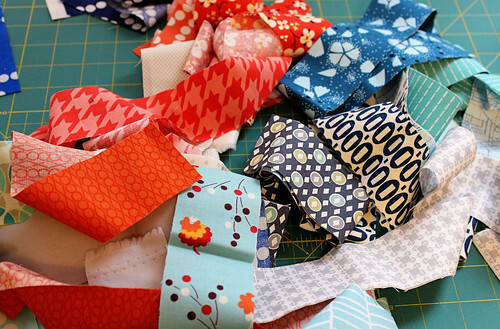 This week I’ve been making some blocks for a new quilt. 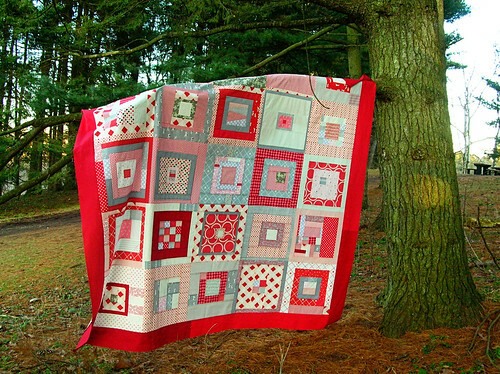 It’s very red, pink, white, and grey. 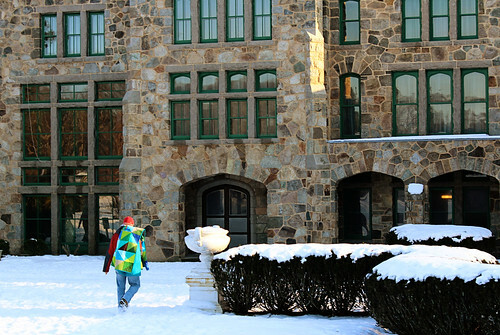 I’m loving those colors right now! 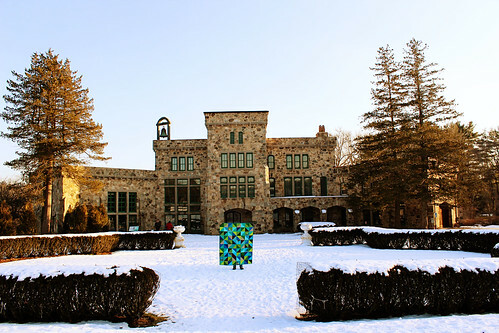 There’s something so wintery but warm about them. 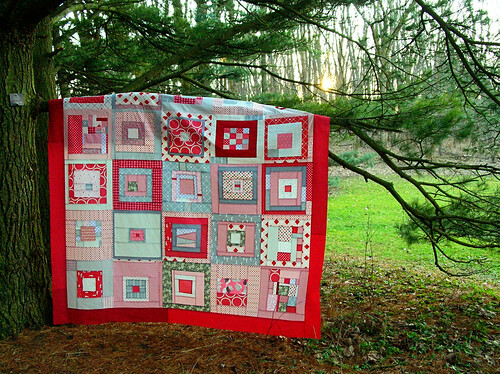 I’m hoping to finish the quilt top by this weekend– I’d love to have it ready to use by Valentines day! 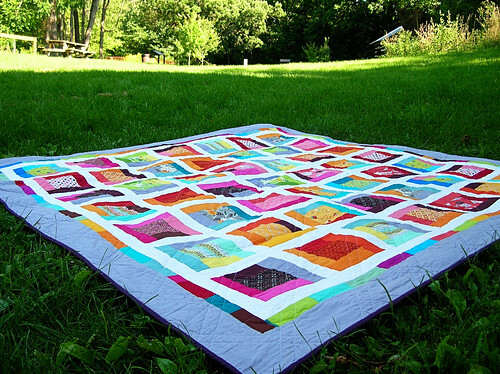 My flea market fancy quilt is done, and I couldn’t be happier with it!! 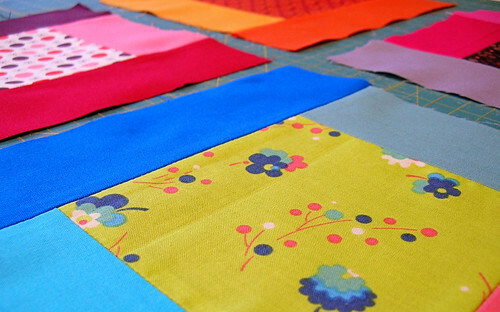 Like so many others, I loved this line of fabric (before I even knew who designed it or what it was named!) so much, and when I had a chance to scoop some up last year I didn’t hesitate. 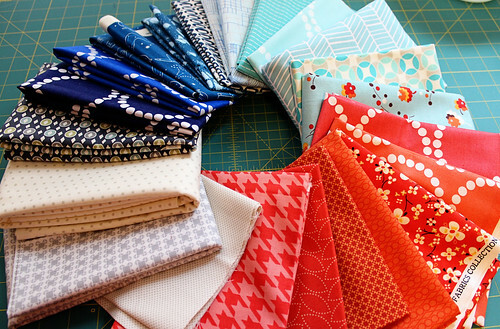 I wanted to highlight each print, and I think that part of the beauty of this line is in the colors used for the prints, so I went to my local quilt shop (which, luckily for me, stocks all 220 colors of Kona cotton solids) and picked out 4 colors that coordinated with each print. 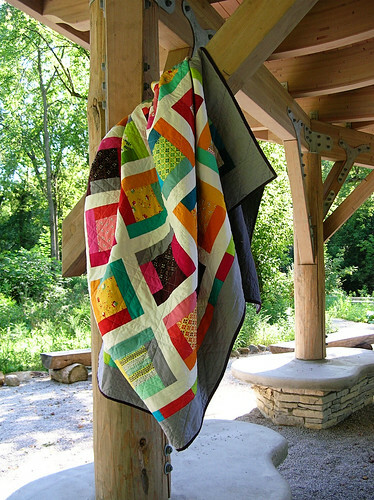 Once I had the squares done, I had a dilemma about sashing color, and I got such good input from my blog readers! 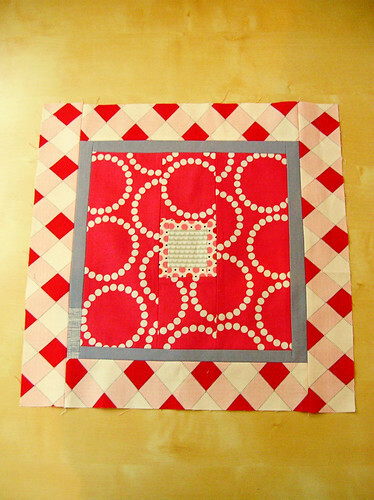 Ultimately, I decided to sash in white, but I still wanted a touch of gray, so I added a border to frame the quilt. 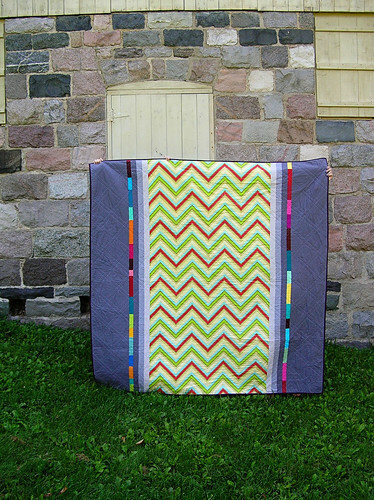 For the back, I used a chevron print I had in my stash, along with some grays and leftover strips of solids. 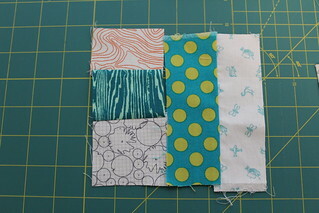 For the binding, I used the Kona cotton color raisin. 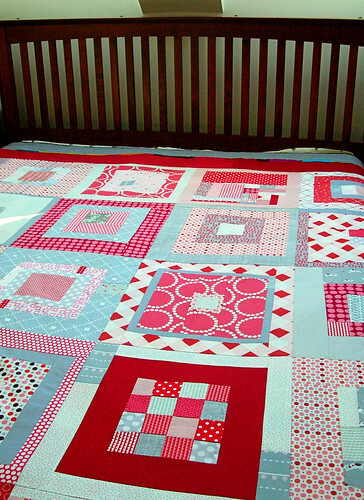 This is the first queen sized quilt I’ve made, and it took quite a while to quilt! 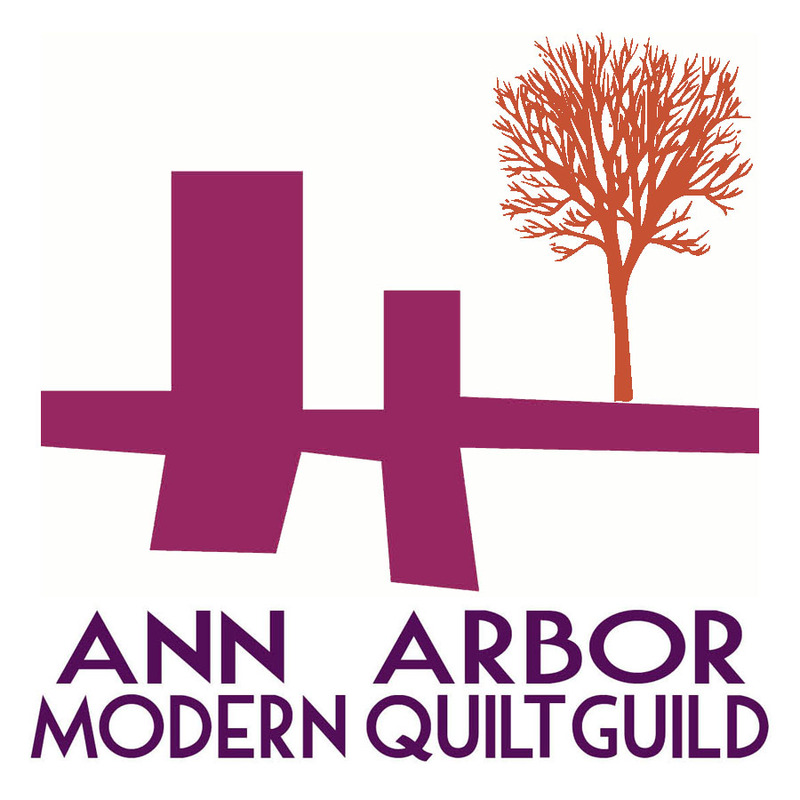 I did it all on my trusty little Husquvarna, and I broke the quilting up into a few different sessions so I didn’t get burned out. 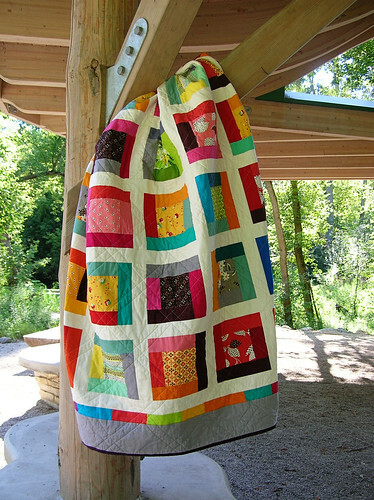 Also, it involved a lot of binding– I think it took me longer to hand finish the binding than it did to quilt! 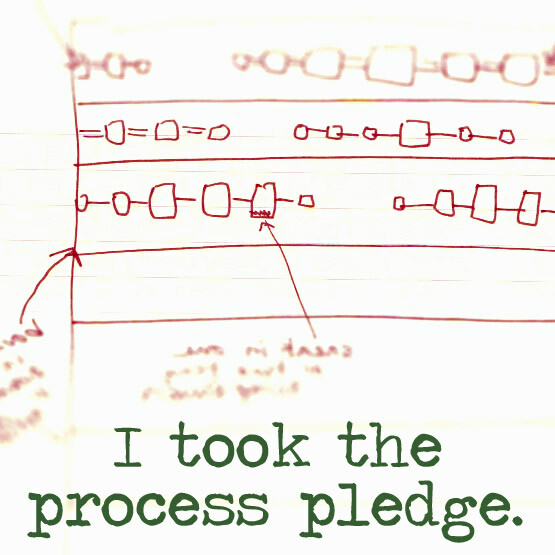 I really enjoyed the process, though, and now I get to sleep under this baby every night! 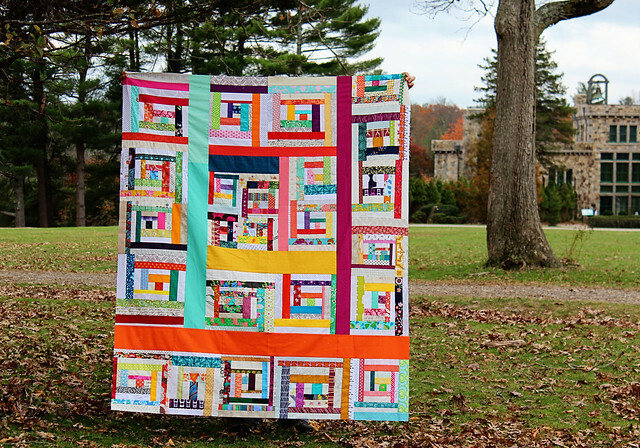 When I bought the fabric I said that this was my plan for it– I wanted it to be something I enjoyed every day, and I’m so glad I took the time to make this quilt for myself. 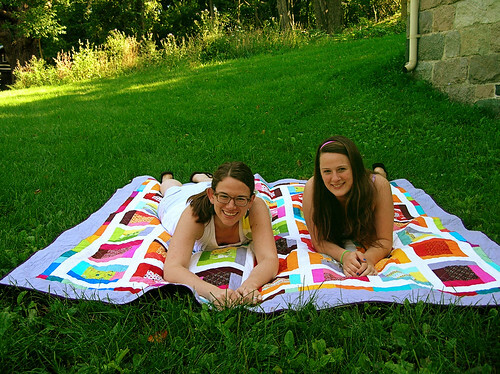 Also, thanks so much to my sisters who helped me take photos of the quilt– it was so big it took both of them to hold it up. It’s a good thing they’re both tall! 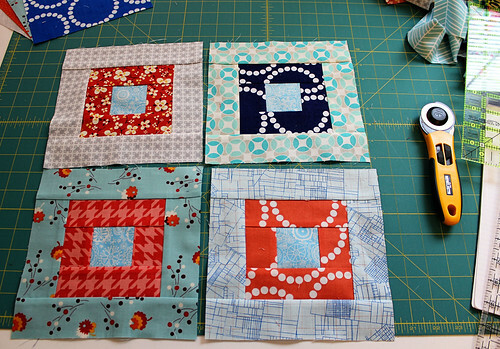 I decided last week that it was time to cut into my very small stash of flea market fancy, and I can’t sop gazing at the first set of blocks I made. 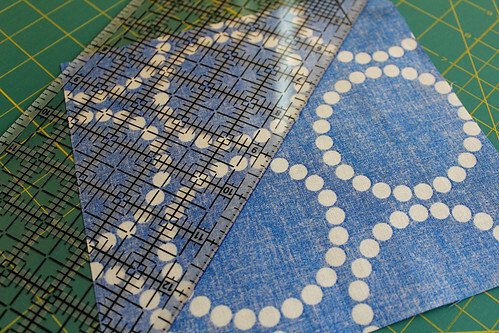 Although I had a little trepidation about cutting into these prints, I figure that fabric is meant to be used, right? 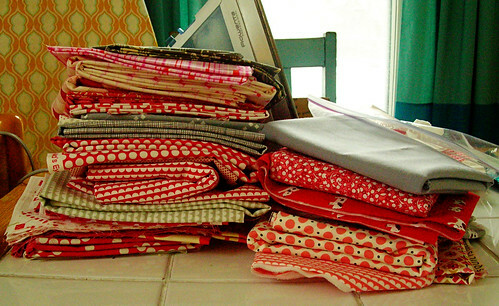 Plus, I think it would make me super happy to have all of these bright colors on my bed in a lightweight summer quilt. 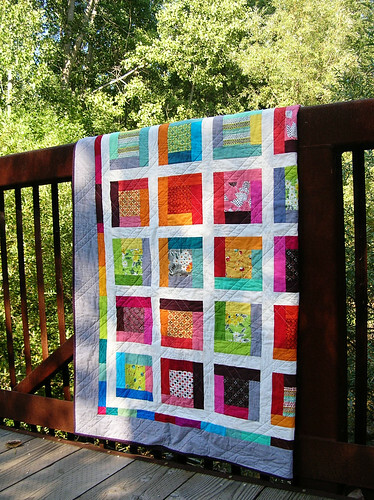 I still have a number of blocks to make, but I can already tell that this quilt is going to be one of my all time faves!